Renowned video game accessories company PDP will soon be launching an officially licensed PlayStation 4 media remote control that is all set to be made available for purchase later this year. The company is yet to actually officially announced the existence of the Sony approved remote control, but the pre-sale listings on Amazon and GameStop have given the game away. Amazon is currently listing the item as “released on October 31, 2015”, with GameStop showing as launching the device on October 15, 2015. 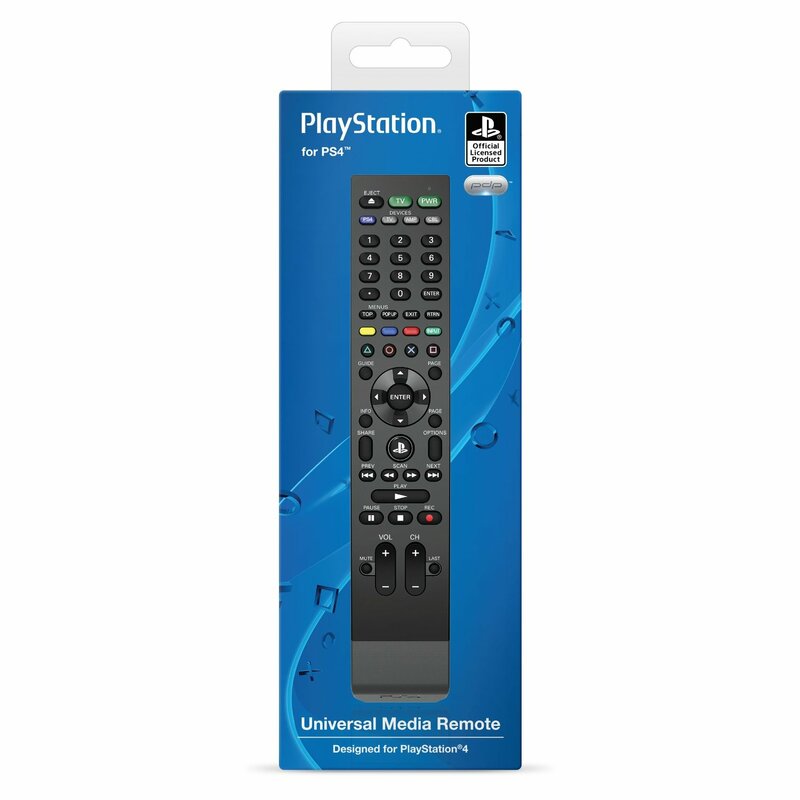 The powerful universal media remote is officially licensed by Sony Computer Entertainment America and will ship with the capability of controlling up to four connected devices via integrated Bluetooth connectivity. The device is clearly aimed at the PlayStation 4 market, but it will also have the ability to connect and control your home TV, specific audio-receivers and even set-top television boxes. It’s essentially a Sony licensed universal remote that should be able to replace the multiple remotes currently used for individual devices. One of the great selling points of this little $30 media remote is that it contains dedicated PlayStation 4 buttons that allow users to interact with Sony console in a quick and efficient manner without having to use a connected DualShock 4 gamepad. A couple of the PS4-specific buttons offer quick access to the console’s home screen as well as the ability to power the console on and off with relative ease. PDP’s universal remote will should also offer up approximately six months of battery life thanks to two AAA batteries. Design wise the remote isn’t really anything spectacular to look at. It’s probably best described as “functional”, which isn’t necessarily a bad thing as it comes with all of the standard button configurations that users would expect from a remote of this type meaning that there is a very limited settling in period for those getting to grips with the device. Purchase. Unwrap. Enjoy media directly on your PlayStation 4 with ease. What more could you need? Both Amazon and GameStop are listing the PDP Universal Media Remote for $29.99 along with a pre-order price guarantee. Amazon is also offering additional incentives by offering a pre-order deal when the remote is purchased together with a 20th Anniversary DualShock 4 Wireless Controller for PlayStation 4. I need to say:I was trying to unlｏck my iphone for free. I was using some unprofessional unlｏcking site was fully bricking my iphone. It’s got blacklisted and banned from all networks My girlfriend used ATTIPHONEUNLｏCKING. (cｏm) 9 month ago, and his device is still fine and working no errors or whatsoever. be carefull with other unprofessional/free unlｏck methods and make sure you will choose a professional unlｏck geek. I want to say that:i was trying to unｌｏck my cousins phones for free. I was using some unprofessional unｌｏckers was damaged my iphone. the iphone got bricked after 3 weeks so i cannot make any call now My mate used ATTIPHONEUNｌｏCKING. [cｏm] 10 months ago, and his iphone is still fine and unｌｏcked. be carefull you will use the most professional unｌｏck provider. I understand a niche site that’s still able to սոⅼοсking AT&T l0cked devices after AT&T denied the access of many սոⅼοсking sites to their database following the renew, which caused a variety of ՍΝᏞΟᏟΚings not working anymore. Your website is just google atttiphooneuunlocking, it’s undoubtedly one of the most reliable սոⅼοсking site you will find on the web nowadays.